Community activist Christopher Marte, who lost the September 12 primary by 222 votes to incumbent Margaret Chin, is challenging her again on the Independent Party line in the November 7 general election. While it’s rare that a non-Democratic candidate ousts an incumbent in the general, Marte is certainly putting up a fight. He’s got $89,000 of campaign funds remaining to her $57,000. He’s got Chinese for Marte 2017 at his back—though two weeks ago a Latino coalition rallied for Chin’s re-election at City Hall. He’s got the Villager’s endorsement, though Chin has the backing of the borough president, public advocate, and many of her female colleagues. A few weeks ago, we reported that a group called Lower East Siders for Christopher Marte, which described itself as an alliance of tenant leaders, local residents, small business owners and residents, was hosting a march to support their candidate. Lower East Siders for Christopher Marte was also present at a community board meeting on October 18 handing out fliers that included a list of nine actions it described as “Margaret Chin’s crimes against our community.” All nine focus on Chin’s record on issues of housing and development. Marte did not endorse the specifics of the flyer. Many of the charges appear overstated or include falsehoods, while the accuracy of others are subject to interpretation. See below for their claims and our analysis. 1. Margaret Chin worked with de Blasio to reject the Chinatown Working Group Rezoning Plan, a plan that puts PEOPLE FIRST and protects all of Chinatown & the Lower East Side. You can argue that Chin should have fought harder for the original plan, but saying she “worked with de Blasio to reject” the plan is a bit much. 2. She helped create Bloomberg’s racist East Village rezoning plan in 2008, which protected a wealthier white neighborhood while excluding the Latino, African American and Chinese communities of the LES. In 2008, Chin was not yet a councilmember and she was no longer on community board 3 then, so there’s no evidence that she “helped create” the plan. Community Board 3 worked with Mayor Bloomberg to pass a downzoning of the East Village in 2008. The downzoning was controversial. While it aimed to protect the East Village from overdevelopment and limit tenant displacement, it did allow upzonings on Avenue D, Houston and Delancey Street, and left southern parts of the district—where a much higher percentage of residents of color live—vulnerable to more development. Frustration with the limits of the East Village rezoning lead to the launch of the Chinatown Working Group effort. Chin was deputy executive director at Asian Americans for Equality, an organization that she helped found and which came out in full support of the downzoning. Chin resigned to run for Council in the middle of the public review process that lead to the approval of the rezoning. 3. She rejected LESON’s invitation to stand with the people to stop the waterfront megatowers. Instead green-lighting the towers and negotiating meaningless crumbs for the community. Chin has not greenlighted the proposed waterfront towers in Two Bridges and does not currently have the power to do so—the de Blasio administration has said that the proposed towers only require approval by the City Planning Commission. She is trying a variety of means to push the administration to make the projects go through the process known as ULURP, which would allow her to have a vote up or down on the projects. She also recently lent her support to an effort by community groups to downzone the waterfront and prevent the towers. The group LESON (Lower East Side Organizing Neighbors) doesn’t trust Chin to vote no on the project if given the chance, and has instead asked her to focus her energy on proving to the City Planning Commission that the projects cannot be approved because they do not legally pass muster under existing zoning and environmental regulations. LESON says Chin has been dismissive of their arguments. While Chin’s staff says she doesn’t disagree with LESON’s approach, they argue it will be difficult to convince the City Planning Commission not to approve the projects and that the best strategy is to focus on getting the projects to go through ULURP. 4. She supported the privatization of NYCHA, like the “infill” on La Guardia Housing’s parking lot, while NYCHA residents get eviction notices and no repairs. Chin has not yet taken a stance on “infill” at La Guardia Houses. The De Blasio administration and NYCHA seek to create more income-targeted housing and boost revenues for NYCHA by working with private developers to build up some NYCHA land, a program some refer to as “infill.” Some of the housing will be 100 percent below-market and some will be 50 percent market-rate and 50 percent below-market. Critics deride the program as an example of the “privatization” of NYCHA, though NYCHA insists that the land will remain owned by the city and is rented to the developer through a long-term ground lease. Chin was critical of an earlier rendition of the program under Bloomberg that would have required only 20 percent below-market rate housing on all sites. As for De Blasio’s plan, Paul Leonard, Chin’s chief of staff, says that she’s approaching it on a “case by case basis.” On infill at LaGuardia Houses specifically, Leonard says Chin feels “NYCHA needs to make the case for why these infill developments are necessary to ensure the long-term viability of LaGuardia houses specifically. Though it’s early in the process, Councilmember Chin does not believe the case has been made.” He adds that Chin wants to know whether the below-market housing will actually be affordable to residents in the community and wants details on the impacts that construction might have on nearby playgrounds and the surrounding community. 5. She encouraged Extell and other developers to build luxury high rises with our tax money through the 421-a program. The essence of the complaint is that Chin is cozier with developers than she should be. It’s true that in 2013 she was one of the top 10 recipients of donations from Jobs for New York, the PAC associated with the Real Estate Board of New York, receiving over $230,000. 6. She refused to halt the sale of Rivington House, displacing AIDS patients in favor of luxury condos. Rivington House was long the site of a non-profit nursing home that served patients with AIDS, but in 2015 it was sold to a for-profit company called the Allure Group that said it would open a new nursing home. In actuality, the company was busy lobbying the city to remove deed restrictions on the building so it could flip the building to a condo developer. The Lo-Down reports that during that year—when Allure was duping the public—Chin played a large role “in efforts to keep the facility open under the ownership of a new nursing home operator.” Lower East Siders for Christopher Marte argues Chin should have used her influence to prevent the nonprofit from selling to Allure to begin with—but no one knew, at the time, that Allure would completely betray its word, and it was a private transaction, so she would have had limited control to begin with. Chin has said that when the Department of Citywide Administrative Services signed off on the removal of deed restrictions on the site in November of 2015, she was not aware the deed was being removed. The Lo-Down finds this believable, given the lack of notice provided to the public about the transaction. An investigation by Comptroller Scott Stringer found many people to blame for this scandal, including DCAS and City Hall, but Chin was not mentioned. 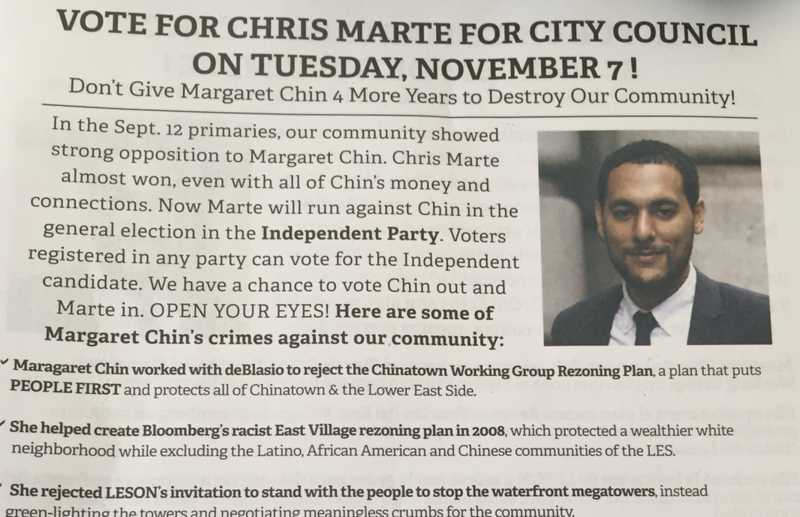 Lower East Siders for Christopher Marte argue that given this debacle, however, Chin should have been less quick to endorse Mayor de Blasio for reelection. 7. Chin, by saying nothing, supports wage theft & sweatshop abuses of home care workers who work for agencies like the Chinese-American Planning Council and United Jewish Council, backers of Chin. Homecare attendants have brought a series of class-action lawsuits against homecare health agencies, including the Chinese-American Planning Council and the United Jewish Council, among others, for practicing what is a state-sanctioned, industry-wide policy called the “13-hour” rule, according to Crain’s New York. Under the policy, if a home care attendant works a 24-hour shift, they are paid for only 13 hours of their time, with the assumption that the worker also takes breaks for eating and sleeping. Workers argue that it’s near impossible to take meaningful breaks and say the policy violates the minimum wage law, but healthcare agencies, for their part, say that paying more than 13 hours will upend the industry and make it extremely difficult to provide care. Leonard noted she’d received the endorsement of the healthcare workers union 1199 SEIU for her progressive leadership on economic justice and healthcare issues. Homecare workers in their suit against CPC, however, have also been frustrated with the role of the union in the fight against the 13-hour rule. 8. She ignored 10,000 residents who demanded 100% low-income housing on SPURA (now Essex Crossing). Chin insulted petition signers, implying that they were too stupid to understand the petitions they signed. When Chin took office in 2009, it was after decades of discussion regarding how to develop the Seward Park Urban Renewal Area and after many stakeholders had already expressed a willingness to accept some market-rate housing if it could help support affordable units. It’s true that Chin did not adopt the position of a group that advocated for 100 percent low-income housing in the Seward Park Urban Renewal Area, expressing concerns that this would be viewed as unrealistic. Instead she supported a plan in which 50 percent of the housing would be rent-restricted. She was also responsible for negotiating to ensure that the rent-restricted housing would be kept affordable in perpetuity. It’s worth mentioning that the idea that public land should always be used for 100 percent affordable housing has gained increasing support in the public as the affordability crisis has worsened, and a variety of councilmembers, from Speaker Melissa Mark-Viverito in East Harlem to Laurie Cumbo in Crown Heights, face pressure to fight for the inclusion of 100 percent income-targeted units on public sites. Some, such as the de Blasio administration, argue that sometimes market-rate housing should be permitted to help a developer offset the costs of providing other public amenities. As for the claim that Chin said people were stupid, Lower East Siders for Chris Marte says that at a meeting with her she said people probably didn’t know what they were signing and that at another meeting, she said, “You are being manipulated to sign something you do not understand.” It was unclear by press time which meetings they were referring to. Chief of staff Leonard, noting that Lower East Siders for Christopher Marte had only existed for a month, called the claims falsehoods. 9. Chin and de Blasio backed a senior housing plan that would destroy Elizabeth Street Garden, despite a viable alternative site for the housing, pitting senior housing against gardens, Chinatown against the LES. It’s true that Chin is backing a senior housing plan that would uproot the Elizabeth Street Garden. As for the alternative site suggested by gardeners—a vacant lot at 388 Hudson Street—Chin says both should be developed with senior housing given the dire need for such housing, but that the Hudson Street lot is not in her district. “With nearly 200,000 seniors languishing on a waitlist for affordable housing across our city, Councilmember Chin has pledged to fight to make sure that everyone has the opportunity to age with dignity in the communities that they helped build,” Chin’s office said in a statement to the Commercial Observer in July, adding that the developers would be required to include a public open space (though a quarter of the original garden’s size) on the site. Asian Americans for Equality, the organization Chin helped co-found, is reportedly one of the groups bidding for the project. Actions speak louder than words! Chin stands for the money not for We The People! Legalized Slavery is all she cares about and making sure that her people are not subject to inclusion on the Lower Eastside. She is guilty of doing nothing for all of humanity on the Lower Eastside of Manhattan. It was almost comical to see Marte hold a rally for the Elizabeth St Pop Up Garden in front of Rivington House a few months ago. He had nothing at all to say about it in the previous year (or was it two years?) that Chin and our community had been fighting its closing and working to return it to its intended purpose. A Marte supporter said to me recently that the neighborhood needs some fresh blood. Fresh blood can be fine (unless it’s in the form of Trump). But Marte, aside from two failed campaigns, has no experience in community service or activism that I know of. Campaigning on the hard work of others shouldn’t be rewarded with a vote. First off, thank you for the run down and analysis. Thorough. Can you elucidate on what you mean, as the sentence (as it is written/as I am reading it) does not make much sense to me. Seth, it doesn’t make much sense to me, either. An editing error on my part that, thanks to you, is now fixed. In politics, if you can tarnish your opponent you have won the fight. Look at our current “president”. It does not help Chin that so much negative things have occurred during her tenure. Wow, for an article that claims to refute many of the positions against Chin, it sure does explain where all of them have more than a lil’ basis in fact. Everyone goes big in advertising, so sure they’d make it sound bad, but as laid out in this article what Chin has done is very bad, and nothing in this article says that the claims are lies. This woman is clearly working against the very people she is supposed to represent. yuck! Just wondering Abigail, if you wrote this piece or if Chin staffers wrote it? Shame on City Limits for publishing Chin propaganda! It appears your investigation and “analysis” amounted to getting Chin staffers opinion. Bottom line is that for all of her years in office Chin has divided the community and resisted efforts to pass the community-led rezoning plan, the Chinatown Working Group Rezoning Plan. Only now, at election time, does she claim she supports it. But under her watch, just look at the highrises coming into the community. All those who work or live in the Lower East Side and Chinatown must come together to demand our elected officials be accountable to us, not the developers! Tosh, just for your information, a Chin aide called us moments after the story published, furious about the article, its “credulous” approach to the flyer and its letting Marte off the hook. He talked really loud and even hung up me. It really hurt my feelings. But I’m getting over it, because I have a deep reservoir of inner strength and also a lot of Halloween candy here in the office. Anyhow, your charge that we’re shilling for Chin is absurd. What we did is called journalism. We reported the facts that are knowable. When things were murky, we noted the murk. The fact that our work seems have to upset partisans of both sides of this race is not surprising. Thanks for this piece. I found it a relief. Not that I agree with all of it, but that someone is trying to look at this race using actual facts. I was on the Chinatown Working Group in 2009 and the very people who blame Chin for the delay were the ones who cost us years by attacking the leadership of the organization and refusing any kind of compromise. In coalitions, when there are contentious issues most organizations will try to find the common ground and then organize to fight for that ground together. All while continuing to challenge any areas of disagreement – but doing so as a distinct organization. That’s how groups move forward. Many groups left because nothing could get done. Now two important organizations have said lets move on this and at least get the Two-Bridges area rezoned now, because they are in crisis. Good to have it moving forward again. it was an organizational problem – not a government elected official one. Chin isn’t perfect, but she has held to her convictions on affordable housing – costing her votes from the gentrified Elizabeth site in Little Italy – where I have lived for 27 years. They insist on the space being solely for open space despite the fact that it will still have 5K sq ft of garden. I can’t abide that given the fact that we have 60,000 homeless people in crisis and seniors wait 7-10 years for housing that is accessible. You can’t age in place in a 5 story walk-up if you can’t…walk up. And last, as the lead for the last 3 years on the Neighbors to Save Rivington House I have to say that attacking Chin to make campaign points has not been helpful to this cause. She, Gale Brewer, Squadron, now Niou and soon likely Kavanagh have all been entirely supportive. All have listened to the neighborhood’s request to fight for the return against all odds. None have been more staunch than Chin. She fought for this to stay a nursing home when VillageCare wanted to sell it off. This is a fight for people who have no voice – people in our community who have Alzheimer’s or who live alone or whose families need to be near them or who need 24/7 skilled care. And before that it was a fight for low-income, of color, people living with AIDS. As to the high-rises, not sure how any one elected official is exactly responsible for a trillion dollar real estate industry and …capitalism? Keep that bowl of candy handy. It’s going to be a bumpy night. Rivington House = There are really only 2 options: either DeBlasio had Chin looked the other way so the deal could be done, or Chin is really bad at her job. There are no other options. I was actively involved in the discussions around Essex Crossing (then SPURA) and Margaret Chin and her staff were outspoken and consistent advocates for 100% affordable housing. I think she eventually moderated her views as a result of her desire to get some housing built on a lot that had been abandoned for 50 years. There were strong forces in place opposed to any affordable housing being built. I have still yet to hear one person say why Elizabeth Street Garden should have been part of SPURA. It is no where near SPURA. ESG had no connection to SPURA. ESG is not even in the same CB as SPURA. Someone rigged this deal for god knows what reason. Whoever made it part of SPURA should go to jail. Please, someone give any good reason for this shenanigan. It’s just too easy to see why something underhanded was done here. Who doesn’t like gardens? ugh. There is no such thing in NYS as the “Independent Party”. There is the “ideologically bereft” Independence Party (see, https://www.villagevoice.com/2017/03/09/think-you-understand-the-depths-of-albanys-dysfunction-meet-the-independence-party/) which, I believe, is the entity that was meant to be cited here as providing Marte its line on the Nov. 7th general election ballot. The ideologically bereft Independence Party gang is funneling money to the infernal IDC, the so-called Independent Democratic Conference, which has handed control of NYS’s Senate over to the Republicans, despite the fact that voters elected more Democrats to the chamber than Republicans. The arrangement has been called “vulnerable to challenge” and is under investigation. Anyone who votes for anyone on the Independence Party line thinking he or she is supporting an irreproachable outside-the-corrupt-two-party-system entity is sadly mistaken. Anyone having a problem with Independent/Independence Party can always just write in Chris Marte. His name on this Ind’ line is so you don’t have to worry about correctly spelling his name. 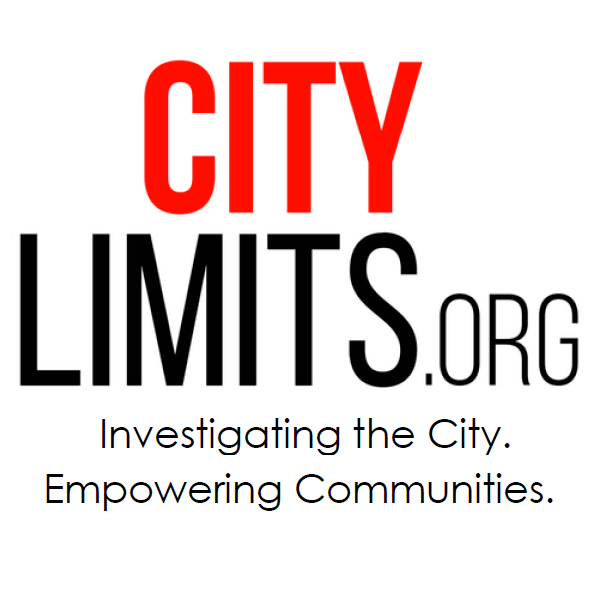 City Limits, a self-proclaimed “empowering communities” journalism site, disappointingly published a piece in defense of Councilwoman Margaret Chin’s displacement agenda, a piece of “factcheck” that doesn’t care about checking the facts. We don’t mind offering a little help. DO YOUR HOMEWORK, City Limits. See below for our response. And here’s our response to that response: We’re very comfortable with our homework. We acknowledge in the story the ways in which Chin has left herself open to some of these charges, but also concluded that the wording of the charges was incorrect. Saying, for instance, that she failed to advocate strongly for the CWG or was too ready to accept an alternative–which might be fair–is very different from saying that she actively worked with de Blasio to reject the plan. Remember, we weren’t examining Chin’s record for how good or bad it was. We were examining the flyer’s accusations for how accurate they were, and we found them wanting on many points. There are nuances in the facts here that make neither allies of Councilmember Chin nor her opponents totally comfortable, and I’m glad we noted them, as that is our job. Empowering communities doesn’t mean simply nodding in agreement when elected officials or grassroots activists — however earnest or admirable–or even, on the larger issues, totally right–they might be — make disputable factual claims. We have to call that out. Plus … bollards, bollards everywhere? Plus, Comptroller Stringer releases an audit of the Board of Elections. Yes, the debate stunk. Yes, the race has been uninspiring. Yes, it is still your civic duty to vote. So, better listen to Ben and Jarrett to figure out what to make of it all.